Two men are to stand trial charged with a murder bid near a school in Bishopbriggs last year. 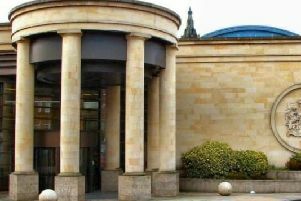 William Burns, 55, and Alexander Porter, 47, faced the charges on Tuesday, October 4 at the High Court in Glasgow. They are alleged to have shot Ross Sherlock close to St Helen’s Primary School last September, with claims that a handgun was discharged. They also face a charge of an acid attack on an investigative journalist and a charge of attempting to defeat the ends of justice. Prosecutors state a car used during the alleged crime was torched together with clothes and a firearm being disposed of. Burns and Porter are also accused of assaulting journalist Russell Findlay to his severe injury, permanent impairment and to the danger of his life. It is claimed sulphuric acid was thrown in the reporter’s face at his home in the city’s west end last December. The charge also includes claims the journalist had a knife brandished at him, was spat on as well as being repeatedly punched and kicked. Both the alleged attacks are said to be “aggravated by a connection with serious organised crime”. Both men’s lawyers entered not guilty pleas on their behalf. Judge Lord Bannatyne set a trial due to begin in January next year.